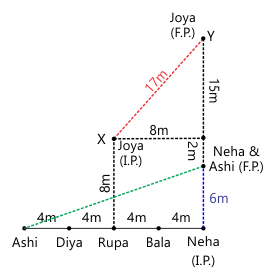 What is the shortest distance between the initial position of Neha and final position of Joya? 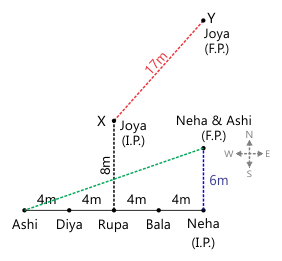 Following the figure we made using the given information we can say that the shortest distance between the initial position of Neha and final position of Joya = (15 + 2 + 6) m = 23 m.
Ashi was standing at the left end of the line. Two persons were standing between Ashi and Bala. Diya stand second to the left of Bala. Rupa was an immediate neighbor of Diya. Only one person stands between Rupa and Neha. Using the given hints we can fix the positions of all the five persons standing in the row. Joya starts walking from point X which was 8 m in north from Rupa. Joya moves 17 m in north-east direction to reach point Y. Point Y and Neha were inline vertically. Here, in the figure below the path of Joya is denoted by Red colour, and I.P. and F.P. means initial position and final position of the person. Neha moves 6 m in the north direction and stops at point Z. Person Ashi moves in the direction to point Z. 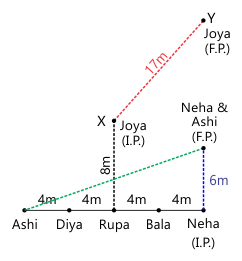 In the figure below, the path of Neha and Ashi is denoted by Blue and green colour respectively, and I.P. and F.P. means initial position and final position of the person. 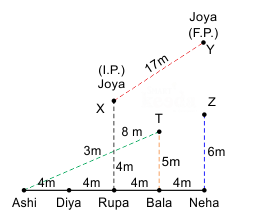 What is the direction of initial position of Joya with respect to final position of Ashi? 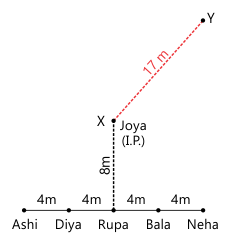 Following the figure we made using the given information we can say that initial position of Joya was in North – West direction with respect to final position of Ashi. 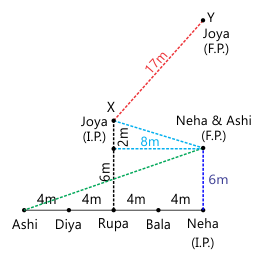 What is the shortest distance between the final position of Ashi and initial position of Joya? If Ashi had stopped at point T which is 5m north from Bala instead of point Z, then what would be the shortest distance between initial and final position of Ashi? Following the figure we can say that the shortest distance between initial and final position of Ashi is 13 m.
Note- T is the final position of Ashi as per the question. There is PQ axis in such a way that P is in north and Q is in south direction. There is RS axis in such a way that R is in west direction and S is in east direction. 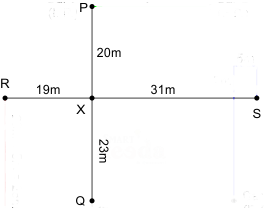 PQ axis and RS axis intersect at a point X in such a way that PX is 20 m, XQ is 23 m, XR is 19 m, XS is 31 m.
What is the shortest distance between the final positions of car A and car B? Following the figure we made using the given information we can say that the shortest distance between the final positions of car A and car B = (5 + 23 + 20) m = 48 m.
XQ is 23 m, XR is 19 m, XS is 31 m.
Car A starts from point R and travels 28 m in south direction and then it takes a left turn and travels 45 m. Car B starts from point P and travels 26 m in east direction. 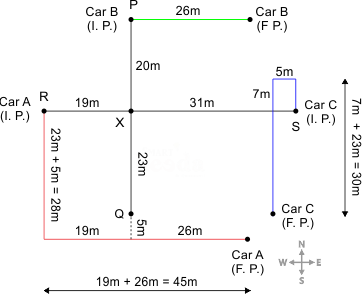 Car C starts from point S and travels 7 m in north direction and then it takes a left turn and travel 5 m and again it takes a left turn and travels 30 m.
Here, the paths of car A, car B and car C will be denoted by red, blue and green colour respectively. In the above figure I.P. means initial position and F.P. means final position.